This single malt was my introduction to drinking whiskey without mixing it. 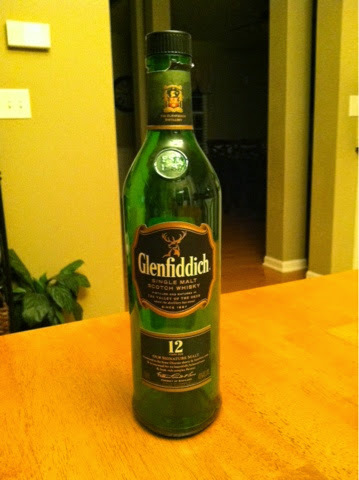 In fact, the Glenfiddich 12 Year is what taught me that I have a taste for and enjoy Scotch, and whiskey in general. This is the dram that introduced me to some of the complexities and nuances of drinking whiskey. It's the dram that taught me how to enjoy a good pour. What I found I like most about the Glenfiddich 12 year is not the initial taste. It has a slight, citrus bite to it, but nothing bold or robust about it. In fact, I find that it's not as drinkable as I would like. It's not the smoothest of pours, initially. However, it leaves a lingering buttery flavor in my mouth reminiscent of the generic butterscotch candies I used to get at Halloween, and that always leaves me wanting another sip. There is nothing overly complex about this whisky, but its simplicity is what makes this one of the most popular Scotches in the world. It's a quality Scotch at an affordable price, and you can pretty much find it an any bar or restaurant in the country. I don't necessarily use the Glenfiddich 12 Year as my standard against which I compare all other Scotches. I actually used its older brother, the Glenfiddich 15 Year as my benchmark. However, when my options are limited, I know it will always satisfy my thirst.